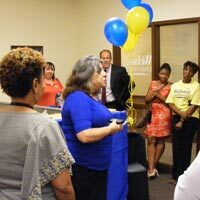 Webster's Lakeland, Florida, campus location welcomed over 50 alumni, students, faculty and staff for a celebration recognizing Webster's centennial year. Local radio station Max 98.3 FM aired a live broadcast from the campus, while Town News Today also covered the event. Beefs Express, a new local restaurant, provided food. Attendees heard from four Webster University alumni who shared their inspirational stories about attaining their Webster degree and the impact it has had on their careers. Slides, historic pictures and stories also provided those in attendance with a better understanding of Webster's 100-year history, including flexibly scheduled high-quality academic programing for busy adult students at the metropolitan campus locations.